"The Dungeon Crawler Where Your Friends Control The Monsters"
Local Multiplayer Arcade Action for up to 4 Players! Out now for Win/Mac/Linux, PlayStation 4, Xbox One and Nintendo Switch! Parsec lets you stream a game and have friends watch and play along with their own controllers. Latency was my biggest worry, but it wasn’t a problem when we played, certainly no worse than our dodgy indie implementation of online multiplayer would have been! If you want to try it out yourself, there’s more details here. What a pleasant surprise to have Nintendo put out this perfect little console for local multiplayer! 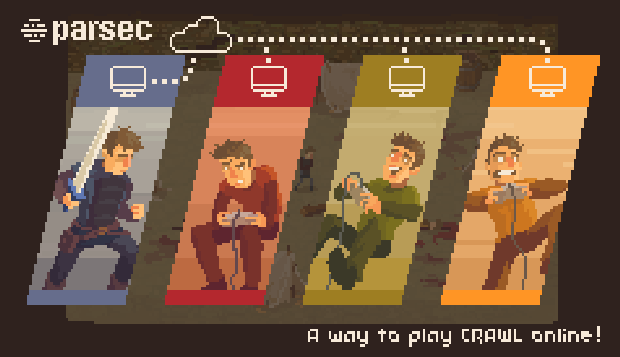 Switch is such a great match for Crawl, and I’m stoked to have a game coming out on a Nintendo console – 12 year old me would totally lose his mind over this, haha 🙂 Thanks for all the support, we have such a great community around this game, and I hope you have a blast with Crawl on the Switch!! Also look for Crawl on Xbox One, PS4 and the Switch store! Discuss Crawl with us and other humans! Post pictures of your cat playing Crawl! Learn the DPS of your favourite Monster! Contact us if you're having issues. Get notifications on Crawl updates, and when we have other cool stuff to show!